At J&S Drilling, we pride ourselves on the strong safety culture prevalent in all areas of our work. Every J&S procedure is carried out in accordance with the company’s Environmental Safety and Health Management System (ESHMS), a set of guidelines and policies designed to ensure the wellbeing of all personnel. All J&S Drilling personnel are authorised to halt any activity if a safety concern is raised; the issue must be addressed and resolved before work can continue. J&S Drilling supports and participates in Worksafe, Resource Safety and Australian Drilling Industry Association (ADIA) initiatives. 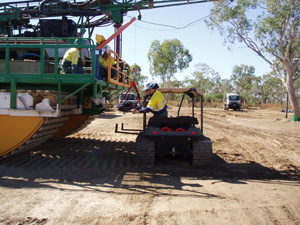 J&S Drilling’s standards more than satisfy pre-qualification requirements with many of the mining and resource sector’s high profile companies. J&S Drilling was recognised by Worksafe as a finalist in the 2013 Worksafe Safety Management System Awards. In 2014 J&S Drilling reaffirmed real time reporting and audits / inspections. This including implementing DMP Resource Safety HIF Audit tools.